56 | TH E M R EP O RT O R I G I NAT I O N S E R V I C I N G DATA G O V E R N M E N T S E C O N DA R Y M A R K E T THE LATEST GOVERNMENT SCOTUS Denies Banks' Request to Review SOL Ruling Several banks challenged a court ruling allowing the FDIC an extended time frame to bring suits regarding mortgage-backed securities. I n January, The U.S. Supreme Court rejected a petition by several banks hoping to review a May ruling that challenged the statute of limitations on when federal regulators could sue financial institutions, in this case, regarding mortgage-backed securities. Last May, the 2nd Circuit Court granted the Federal Deposit Insurance Corporation "extender provisions" that allowed the FDIC to sue banks regarding mortgage-backed securities purchased by the now-defunct Colonial Bank of Montgomery, Alabama. The chal - lenge was based on the fact that the FDIC filed its claims after the three-year mark to sue, according to the Securities Act of 1933. The ruling was related to a 2013 ruling in a case concerning UBS that opened the door for what several banks thought was an overreach of federal securities laws defining the time frame when institutions could have suits brought against them. In October, several banks—First Horizon, Credit Suisse, Deutsche Bank, HSBC, RBS, UBS, and Wells Fargo—petitioned the court in October to review a ruling in the U.S. Court of Appeals that allows the FDIC more time to sue banks. The banks at the time faced a dozen lawsuits from federal regulators amounting to more than $30 billion in claims. The Supreme Court concluded that the banks' case "concerns a purely legal question of federal statutory interpretation" of whether the extender provision overstepped the Securities Act's Financial Institutions Reform, Recovery, and Enforcement Act of 1989 (FIRREA) statute. "The defendants have not identified any aspect of the Supreme Court's decision in CTS that requires us to revisit our UBS holding," the ruling stated. "Accordingly, that holding controls this case, and mandates the conclusion that the FDIC's complaint was timely." 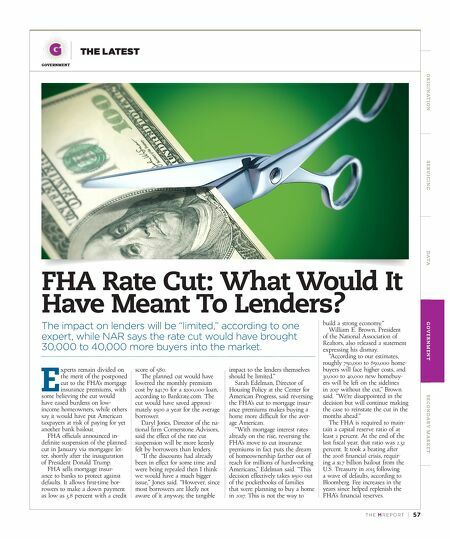 Robert J. Giuffria, a partner with Sullivan & Cromwell, and representing the banks, said in an email to DS News, "We're disap - pointed and hope the court decides to review this important legal issue in a later case." 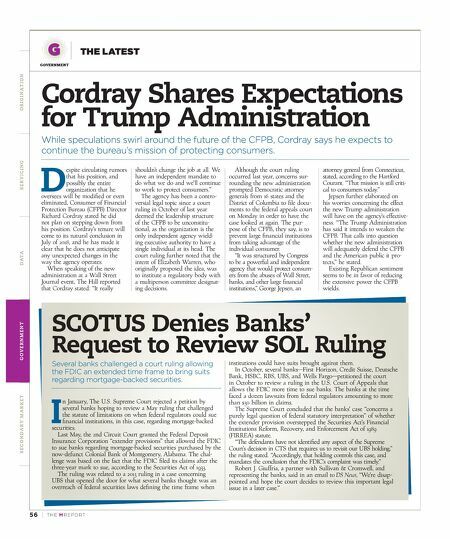 Cordray Shares Expectations for Trump Administration While speculations swirl around the future of the CFPB, Cordray says he expects to continue the bureau's mission of protecting consumers. D espite circulating rumors that his position, and possibly the entire organization that he oversees will be modified or even eliminated, Consumer of Financial Protection Bureau (CFPB) Director Richard Cordray stated he did not plan on stepping down from his position. Cordray's tenure will come to its natural conclusion in July of 2018, and he has made it clear that he does not anticipate any unexpected changes in the way the agency operates. When speaking of the new administration at a Wall Street Journal event, The Hill reported that Cordray stated: "It really shouldn't change the job at all. We have an independent mandate to do what we do and we'll continue to work to protect consumers." The agency has been a contro - versial legal topic since a court ruling in October of last year deemed the leadership structure of the CFPB to be unconstitu - tional, as the organization is the only independent agency wield- ing executive authority to have a single individual at its head. The court ruling further noted that the intent of Elizabeth Warren, who originally proposed the idea, was to institute a regulatory body with a multiperson committee designat - ing decisions. Although the court ruling occurred last year, concerns sur- rounding the new administration prompted Democratic attorney generals from 16 states and the District of Columbia to file docu - ments to the federal appeals court on Monday in order to have the case looked at again. The pur- pose of the CFPB, they say, is to prevent large financial institutions from taking advantage of the individual consumer. "It was structured by Congress to be a powerful and independent agency that would protect consum - ers from the abuses of Wall Street, banks, and other large financial institutions," George Jepsen, an attorney general from Connecticut, stated, according to the Hartford Courant. "That mission is still criti - cal to consumers today." Jepsen further elaborated on his worries concerning the effect the new Trump administration will have on the agency's effective - ness. "The Trump Administration has said it intends to weaken the CFPB. That calls into question whether the new administration will adequately defend the CFPB and the American public it pro - tects," he stated. Existing Republican sentiment seems to be in favor of reducing the extensive power the CFPB wields.